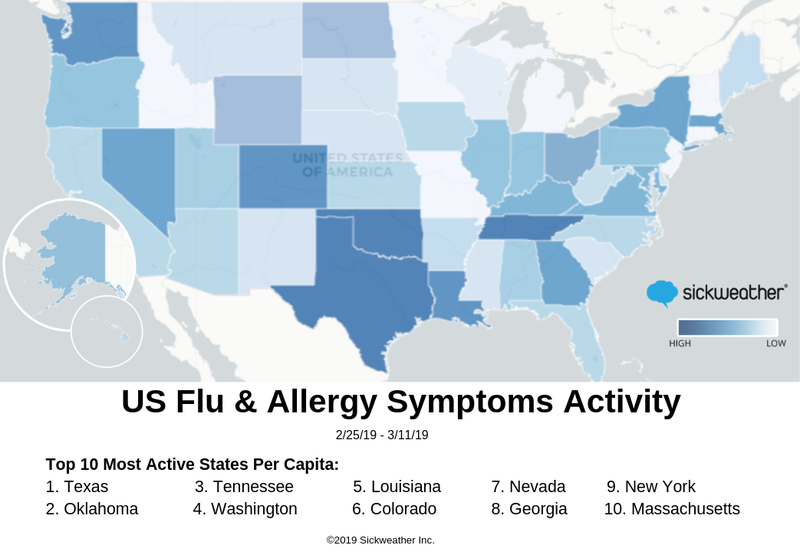 Sickweather, the popular illness tracking app which powers illness forecasts for IBM’s Weather Company and the pharmaceutical industry, is predicting a severe allergy season along with a late flu peak, to create a rare one-two punch for many sufferers. The most “at risk” states from highest to lowest are: Texas, Oklahoma, Tennessee, Washington, Louisiana, Colorado, Nevada, Georgia, New York and Massachusetts. Sickweather is predicting this illness phenomenon to continue over the next three weeks. “If you’re an allergy sufferer, do whatever you can to reduce inflammation during this time, and be sure to wash your hands!” concludes Dodge.